(Denmark) – Louis Poulsen reintroduces outdoor light in Mini and Maxi editions, featuring significant technical updates. 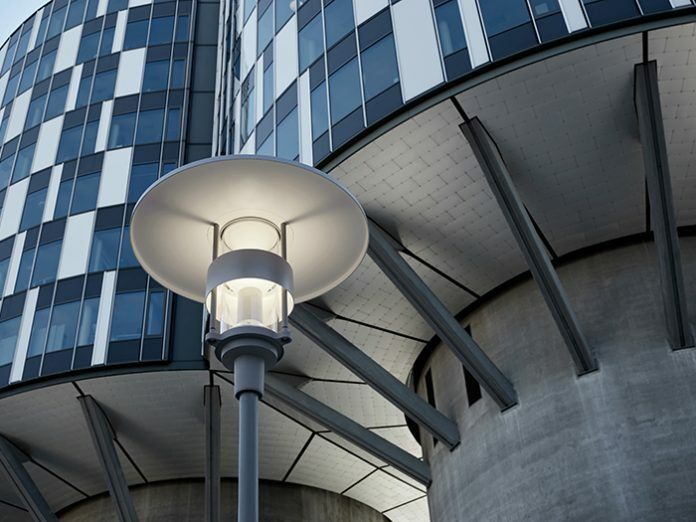 Now including several dimming options, Smart City compatibility and easy maintenance features, the Albertslund Post makes itself at home wherever ambient and glare-free light benefits people and spaces. From parks, pathways and harbours in urban neighbourhoods to university, hospital and company campuses where numerous buildings need to be connected in a seamless, easy-to-navigate network. Originally designed by Architect Viggo Møller-Jensen, every element of the Albertslund Post is designed to shape light in an ideal manner for outdoor applications. The large round top shade reflects the light and directs it downward to the ground where needed. A clear cylinder beneath the top plate is wrapped in the middle by a shielding ring to prevent glare. White-painted reflectors also aid in creating diffused, comfortable light distribution. The result is symmetrical, glare-free, downwardly-directed illumination that complements its surroundings as it brings comfort and guidance.